So I have the validation rule below that compares the 3 picklist and cannot have the same value. When I tested the rule it works as expected when you select a value. Problem is the defualt value of the picklist is none meaning blank and I need to have this rule to to not show the error if both or all 3 of them is blank. These fields are not required to have value but if populated it needs to be different from each other. Is there a way to do this? The campaign object was renamed and I just reset it in a sandbox to Campaign. However now on the opportunity object the field that should be Primary Campaign Source is still Primary [old campaign custom name]. Is there any want to change it back? I have a flow that has the user upload a document. I'm storing the document/s id's, but as a Collection Text varible (no other option). I want to be able to reference the document id to a praticular record, but seems I have no way of doing this as its a Collection. How can I update an Object record with the values from a Collection? Next to current screen please drag a loop element, where you can create a single text vraibale to iterate the collections of ids. Add an Assignment element and you can access individual Record Id (In my example varRecordId). Link the Loop to Assignment and Assignment to Loop again to close the loop. My flow works and I can update all fields of all types. but I still want a way to prepopulate the picklist values on the screen. We can add a Static choice as default selected choice currently. Just click on "Add Choice" button and, add a new resource of choice type with a static value. That newly added choice will be available for select in Default Value picklist. Can I run a SQOL query from WorkBench to find the last login for a user licensed with a particular Installed Package? I also found an open idea for the simillar request. I would like to automatically create a related child record on EVERY Account that is created in our Org, but so far the Process I created with process Builder is not firing. Not sure if the "entry criteria" are correct, do I need to select "Just execute actions"? or what else? Set the Primary Object as Account. Set the evaluate only on Create. Set the Criteria to No Criteria just execute. Set the Action to create record. For our support cases, we want to track all the issues reported by the customer in one support case. Out product can have more than one issue. I'm trying to find out what's the best way to represent such data, I already know that management would want to see cases per issue, so I need to provide this ability. I can use multi picklist, which I know is painful in regards to reports, or I can use a custom object called "issue' and to create records of the issues available and relate them to the case. What is the prefered way? Maybe there is another approch which I have not thought about? Perfect so I would create issues as an object and use that object to store your entire list of issues. Then I would create a junction object called related issues that has a master detail to the case object and another master detail to the issues object. This way you can maintain your master list of issues, you can add multiples to a case,and it makes it easily used for reports and dashboards. I'm working on this https://developer.salesforce.com/trailhead/force_com_admin_advanced/advanced_formulas/text_formulas Trailhead challenge at the moment. "Challenge Not yet complete... here's what's wrong: The Lead object does not display the formula fields correctly. Tip: check the requirements again and make sure you have the correctly[SIC] forumlas[SIC] and their values." 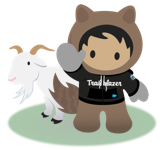 I've been told by the managing editor for Trailhead that where challenge states that the "helper formula should be of type Number" & then later in the text that the "helper formula should be of type Text", the latter statement is a typo and the helper formula should be of type Number. That typo is being fixed. I've referenced several formula fields (Email_IsBlank__c for example) from the Lead_Quality_Helper__c field because as far as I'm aware, it's not possible to calculate a running total from the result of the evaluation of several fields, using IF( or CASE( checks for every permutation would result in a very long formula and this part of the trail recommends helper fields like the one's I've referenced! I've also been told by the editor that the above will cause the check to fail so I'd be interested to see the shortest possible IF( or CASE( formula..
Alex, how about simply using this? We are trying to build out our course registration with custom objects. We were previously using opportunities to record the information, but ran in to a few speed bumps (limited field space and the inability for our chatter users to access the information). We have experimented with Custom Junction Objects and have successfully made an "add contact" field to the custom object, the problem is that we are limited to adding one at a time (compared to Opportunities ability to look up multiple). Any thoughts on how we could replicate the simplicity of the Opportunities' contact role look up in a custom object? Contact role is really just a junction object. You will need to do the same on your custom object. Build another object (Junction) between your custom object and contact. Copy changes from one sandbox to another sandbox? I created and tested a flow in Sandbox A. I made some changes in production that would take me forever to replicate so I created Sandbox B to include the changes already in production. Is it possible to move the flow I was testing in Sandbox A to Sandbox B so the flow I am testing is based on the actual config of our current org? You can configure your Deployment Settings in the Sandbox to allow Inbound Change Sets from the other Sandbox.